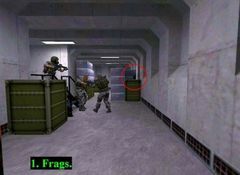 This was one of the first maps I played online with other players, when I first started playing Sven Coop (my first online MP game!) and therefore I remember it well. 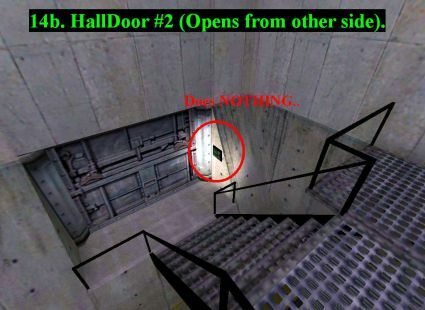 What I actually remember, was a ton of frustrated players whacking and shooting that blasted store room door for an eternity, before finally changing the map in frustration! Now, some years on, I can figure out the problem and have made a simple fix for it. The main issue was the store room door which has a breakable trigger area along the right-hand side which when attacked, makes the familiar "breakable" crunching noise - leading players to believe that with sufficient damage it would eventually break, opening the door. 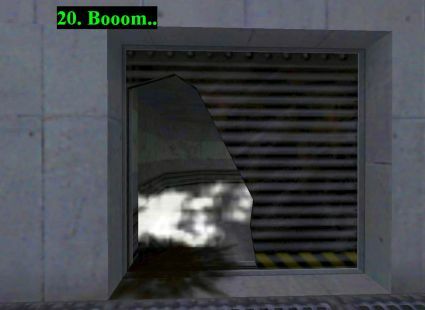 Correct assumption, except that the mapper set the door's health to 99,999 (yes) which would require a ridiculous amount of pounding/shooting/exploding to destroy! 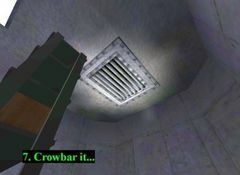 However, the breakable area was also set so that ONE whack of the crowbar would break it instantly.. a fact which is advertised nowhere, and this is made worse by the total omission of the crowbar anywhere in the map or the spawn inventory. 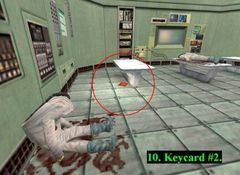 Very misleadingly, the mapper included the pipe-wrench for players, but this doesn't trigger the breakable door in the same way as the crowbar, leading to much rage-whacking and cursing. 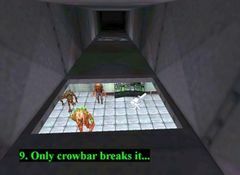 The same problem reoccurs in two vent grilles which must be broken in order to proceed; both have the same 99,999 health, or require ONE crowbar whack to break - altogether very frustrating! 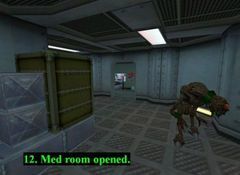 The map itself is very well constructed, and is both complex and detailed, with some lovely architecture, a linear style mixing combat with object-hunt and exploration. 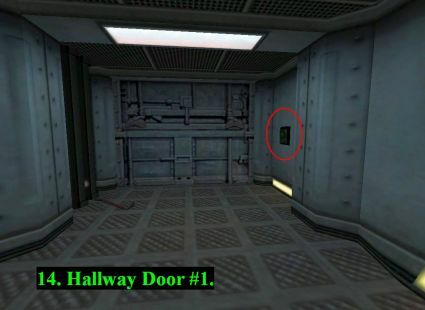 The entity work is as good as the brushwork, with everything clearly named and nicely logical. Also, when you figure out the mechanics, everything (eventually) functions correctly. 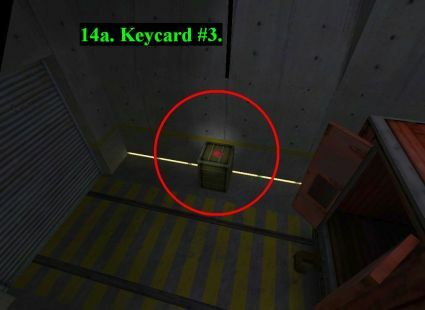 It's just a shame that such a simple problem caused the map to be ignored by so many, for so long..
Pic 1 & 2 - Use the frags to detonate the explosive crates, and then pick up Keycard #1. Note that the frags are denied once the crate explodes, so grab plenty beforehand. 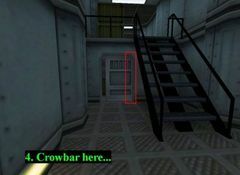 Pic 3 - Find the crowbar. This is crucial! 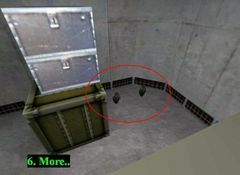 Pic 5 & 6 - Grab all the goodies..
Pic 7 - Stack players (if you are not on XPM server) to reach the grille, and whack it with the crowbar. 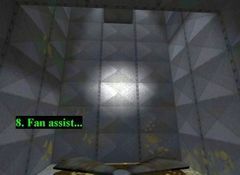 Pic 8 - This is tricky on a non-XPM server, you have to jump into the middle of the fan, and hover on a column of air as you rise up. Overshoot the vent hole, and slide down the wall from above it. 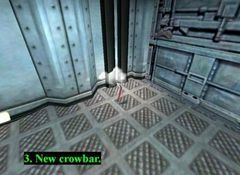 Enter the hole with forward-crouch as you fall. 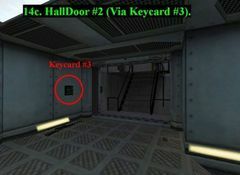 Expect more than a few deaths trying..
Pic 10 - Drop into the room, and grab Keycard #2. 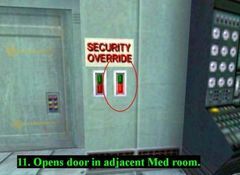 Pic 11 - This switch doesn't open the door in front of you, but rather the one in the adjacent med room, into the corridor (Pic 12). 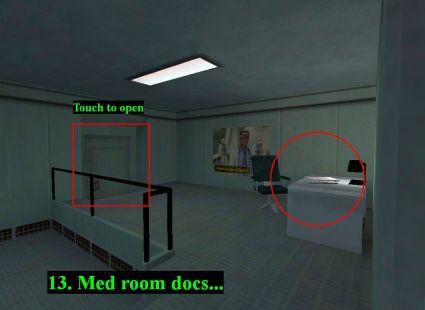 You can't get out of this room on your own (if you are playing SP then suicide/respawn), someone in the corridor will have to go through the first med room (Pic 12 & 13) and touch this door's other side, to let you out. Pic 13 - Grab the mission-critical Secret Research Documents / Pizza menus from the desk. 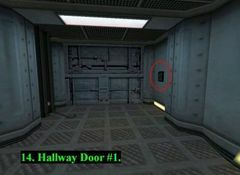 Pic 14a - Turn right after the Pic14 door and proceed. 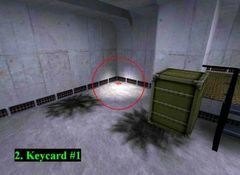 At the far end of the tiny railway track, grab Keycard #3. This will allow the door above you (by the crane controls - Pic 14b & 16) to be opened, but only from the side with the sniper rifle (Pic 14c). It's a handy shortcut for getting help with the crane, or for respawning players. Pic 15 - Drag the explosive crate all the way down the track, towards the small cargo lift. Pic 16 - Climb up to the crane controls. 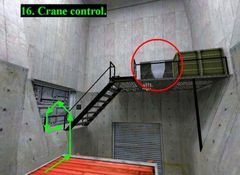 Put someone in the crane container and send them over to the opposite side. 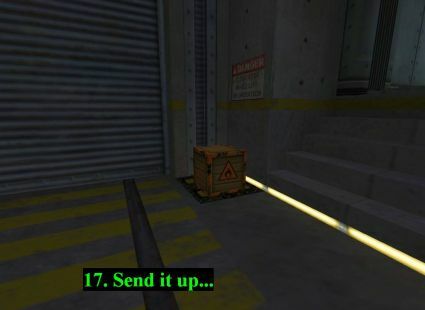 Get them to press the red button to send down the cargo lift. Pic 17 - Load the explosive crate onto the cargo lift, and have it sent up. Watch out, as its arrival opens the door up there.. be ready! 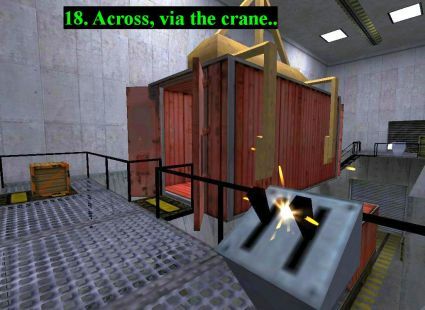 Pic 18 - If they survived, get the player to drag the explosive crate from the cargo lift into the crane container, and send it across to your side, by the door with the steam-death hole in it. 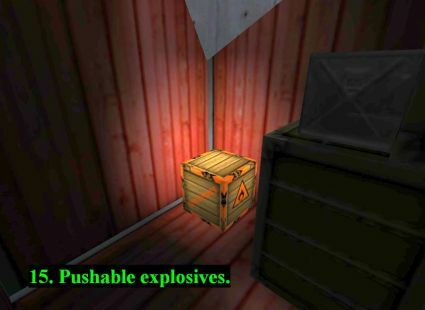 Pic 19 - Stuff the explosives into the hole as far as they will go. Do I need to say "RUN..!!"? Pic 20 - Now you can jump over the steam without being broiled (so long as you are quick). Quality of architecture and attention to detail. Good lighting too. All the entities worked (in the end). Difficulty about right - ok for SP on xpm server, or team of 4 or 5 on vanilla server. No direction, or instruction - obscure objectives, impossible obstacles. 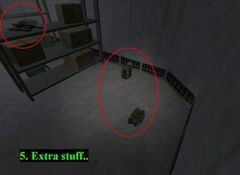 Exceesive face-spawning of monsters, with generally excessive HPs. Ocassionally the steam-hole doesn't break properly.